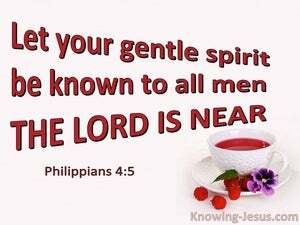 ﻿ Philippians 4:5 Let your gentle spirit be known to all men. The Lord is near. Let your meekness be known to all men. The Lord is near. You should let your gentleness be known to all people. The Lord is near. [Note: This "nearness" could refer to Christ's second coming or to His nearness to His people in a spiritual sense]. Let your gentleness be known to all men: the Lord is at hand. Let your gentle behaviour be clear to all men. The Lord is near. let your meekness be known unto all men. 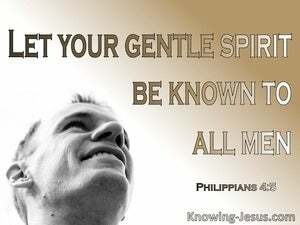 Let your gentleness be known of all men. The Lord is near. Let your clemency be made known to all men; the Lord is nigh. Let all men see your forbearing spirit. The Lord is coming soon. Let your gentleness be known to all men; the Lord is at hand. Let your moderation be known unto all men. The Lord is near. Let your fitness be known to all men. The Lord is near. Let your gentleness be made known to all people. The Lord [is] near. Let your softness be known unto all men. The Lord is even at hand. Let your forbearance be known to everyone; the Lord is at hand. Let your reasonableness be recognized by every one. The Lord is near you. Let your gentleness be known to all men. The Lord is near. 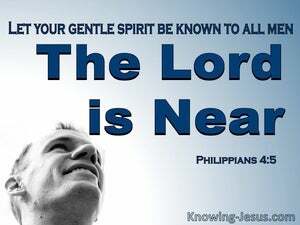 Let your gentleness be known to all men; the Lord is near. Let your forbearing spirit be plain to every one. The Lord is near. Let your forbearing spirit be known to every one--the Lord is near. Let your forbearing spirit be known to everybody. The Lord is near. Let your forbearance be known to all men: the Lord is near! 4 Rejoice in the Lord always; again I will say, rejoice! 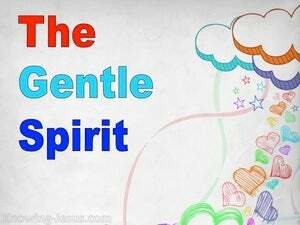 5 Let your gentle spirit be known to all men. The Lord is near. 6 Be anxious for nothing, but in everything by prayer and supplication with thanksgiving let your requests be made known to God.